Pauline Sanderson, from Strathspey, was part of a team which completed the world's longest climb last year, cycling from the Dead Sea - the lowest point on Earth - before ascending Everest. Her husband Phil joined her for the climb up Everest making them the UK's first married couple to reach the 29,028ft (8,848m) summit. Here Pauline tells the BBC Scotland news website how she was touched by human kindness - and tragedy - on the planet's highest mountain. Can we please celebrate the people of Everest. So, why do I want to celebrate the people of Everest? Easy, they are a great bunch of people. We hear so much about the commercial, soulless, selfish attitude on the mountain. I would like to contradict this. Our team experienced a huge amount of mutual support between teams and people. Let me tell you about some of them. 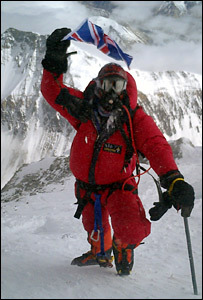 I was part of the Everestmax team that achieved the longest climb on Earth in 2006. 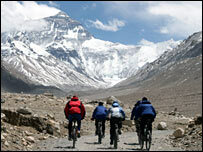 We cycled over 8,000km (4,970 miles) from the Dead Sea in Jordan - 410m (1,345ft) below sea level - to Everest Base Camp. There we exchanged bikes for crampons and climbed the mother of mountains herself. As a team of five cyclist/mountaineers and two support team, we had spent three months together full-time. We knew each others habits and strengths and weaknesses. To me we had the ultimate team because we knew that we would be there for each other no matter what and that the journey was the most important thing. The summit was obviously hugely important but for all of us without exception, coming home was the priority. We were one of several teams that were friends who were sharing a huge challenge with the same ethos. 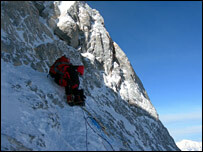 We had eight climbers come to join our team at Base Camp. One was my husband and long-term climbing partner Phil, who added a huge amount of Himalayan climbing experience to our team. Another was Dr Andrew Sutherland who was invaluable to our team and many other teams. He was a doctor first and a climber second. He saved the life of our cook, a man on the North Col during his own summit attempt and was generally called upon by many people from other teams and was always there for them. He even found the energy on his descent from the summit to stop and get the wedding ring from around the neck of our friend Jaques who had died. His heartbroken wife Caroline had made the request and the doc did not let her down. Then there was Patrick Worthington, who was to take charge as Base Camp manager with a personal goal of the North Col.
Again he was an invaluable addition to the team as he always put the team and other people first. He was the one who managed to meet every team and Base Camp and encourage people to see our camp as a coffee shop. At over 5,000m (16,404ft) it is quite an effort to go door knocking. We let other teams use our generator to charge their cameras and laptops, the Spanish gave us Parma ham and the Irish gave us Jaffa Cakes, the French coffee and the list goes on. We shared weather reports and ideas. We didn't want to beat each other to the top, we wanted to help each other. This is the story that should be celebrated, because this is the day-to-day life for two months. Then of course there was our Sherpa team. They were everything you could want. They were hard working and experienced with a great sense of humour. I had lived and worked in Nepal running an expedition company for four years, so I am fully aware of how strong these people are and they will never let you down, even to their detriment. We had to really impress it upon them to let us know if any of them was not well. We are a team that will deal with it as a team. As a team we all made them feel they were our team, not our employees and hopefully that is how they felt. I saw this attitude in other teams, not just our own. Russel Brice deserves mention as the north side answer to mountain rescue. People are fast to publicise tragedy but slow to celebrate rescue. Russel runs the longest standing commercial company on the north side. He is the first port of call for any team with a problem and as far as I know, he has never said no to anybody in trouble. He supports local schools, monasteries and most importantly the people. He goes there every year to another home, not just on a money making exercise. He is respected and loved by his team and he gives more than he takes. How often is that celebrated? So, in conclusion, I would like to say that my personal experience on Everest was not one that I feel was dominated by self focussed summit madness. Yes it exists, even to a point within members of our own team, but it is not the dominant characteristic. If anything, respect for the mountain and the consequences to others was more talked about than 'bagging her'.